This beautiful young lady suffered a traumatic cycling injury as a teenager. Several front teeth were either broken or displaced. Due to her high smile line, she easily displayed the mismatched shapes and sizes of her front teeth. 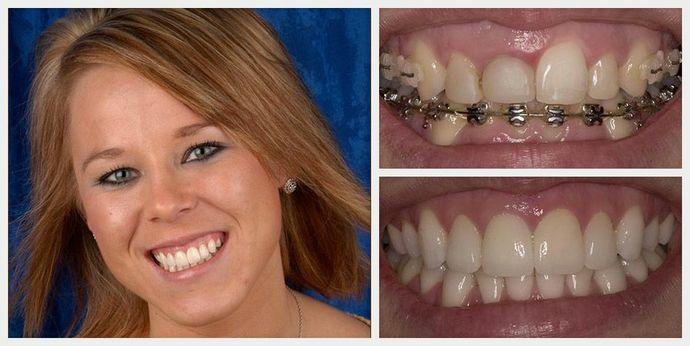 This dental disability was a huge psychological impediment that affected Amy’s demeanor and personality. Using a combination of orthodontics and specially shaped porcelain crowns (ceramic glass protective caps), I was able to create the illusion of gum line symmetry in this highly visible smile display. This kind of dramatic life-altering dentistry is highly rewarding and incorporates several of the skills I have honed in my post graduate training at the Kois Center in Seattle, and my Accreditation in the American Academy of Cosmetic Dentistry, an intense protocol showcasing cosmetic dental skills. Only 350 dentists worldwide have passed this rigorous test.